Rangapravesham a Solo Kuchipudi Dance Recital - Naureen Mehra dynamic and promising disciple of Dr(s). Raja , Radha & Kaushalya Reddy will be having her Rangapravesham on 21st November 2018 at Kamani Auditorium. She will be enthralling the audience with her graceful and intricate dance moves during her first solo performance. Naureen has been training under her world renowned Gurus since the tender age of seven years. . The contributions of the legendary Kuchipudi dancing couple Padmabhushan Drs Raja Radha Reddy and Kaushalya Reddy to the rich and vibrant cultural landscape of Delhi are immense. They are credited with training hundreds of students under their watchful eyes so that they carry forward the rich cultural heritage of Kuchipudi and One such student is Naureen Mehra. In keeping with the tradition of commencing a dance recital with a prayer to the Gods, the evening will start with an invocation of Lord Venkateshwara in the form of ‘Shree Venkateshwara Stothram’. This will be followed by ‘Dashavtara’, a dance item which depicts the ten different avatars of Vishnu, the god of preservation. Next up will be 'Tarana', a Hindustani Musical item, and a composition of the sitar maestro Bharat Ratna Pandit Ravi Shankar. Raja and Radha Reddy have choreographed this item in Kuchipudi classical dance style. The dancer is depicted as a sculpture that comes to life and dances merrily at the temple’s celebration and in the end, feeling sad again freezes back into sculpture. Naureen’s ‘abhinaya’ skills will come to the fore in her performance on the popular Sufi song ‘Chaap Tilak’. 'Chaap Tilak Sab Cheeni' is a poem composed by Amir Khusro, a 14th century Sufi mystic. The evening will conclude with ‘Tarangam’, one of the most popular items from the Kuchipudi repertoire, wherein Naureen will showcase her rhythmic footwork patterns by dancing on the rim of a brass plate, depicting famous stories from Lord Krishna's childhood. Naureen has been training under her world renowned Gurus at Natya Tarangini Performing Arts Centre, since the tender age of seven years. She is blessed to be a part of the Natya Tarangini troupe and at times, she has been the youngest member of the troupe, performing at numerous cultural events within the city and outside. She promises to enthrall the audience with her graceful and precise dance moves during her first solo performance. A Class XI student of The Shri Ram School, Moulsari Campus, Naureen is a multifaceted young girl who has varied interests ranging from sports like badminton and swimming to art. 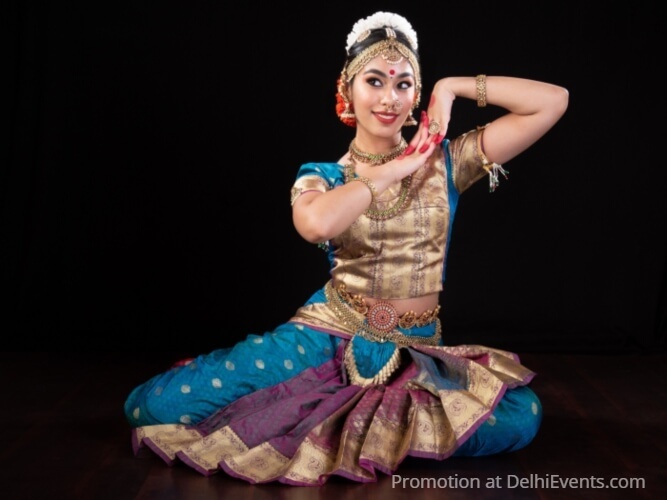 She wishes to win laurels by excelling in this holistic classical dance form and making her Gurus proud.